Kevin Pamu is a graduate student from Hyderabad, India. He is specializing in Computer Science and is a graduate assistant at Morris Library. Why did you choose SIU? SIU has a great program for computer science. The research that was being done in the field of computer science on campus really impressed me. The campus looked amazing, great infrastructure, and when I heard about scholarships that were offered to students who performed well, I did not look any further. What inspired you to choose your area of study? I have always been a geek. I was an inquisitive kid. I was introduced to computers at a young age and every time I explored the possibilities this box of electronic equipment offered, I was drawn deeper into the world of computer science. Microsoft Paint was like magic when I first used the application, but what had me hooked was how it was able to do it. I guess it was that inquisitive nature in me that grew my love for computers and inspired me to choose this as my area of study. What achievement in your life are you most proud of? I am proud of where I am right now at this moment. It wasn’t an easy task to be at SIU as a graduate student. I had to take a lot of tests, score well enough to be accepted into this university, followed by the VISA interviews. I was blessed with some great student worker jobs, a graduate assistantship and loads of amazing friends. I am happy and proud of the place I am right now. Why should someone consider donating to Morris Library? Morris Library caters to multiple needs of students at SIU. Books, yes! We know it has over 2.6 million volumes which are an endless resource of knowledge. It is a great place for group study, with study areas that are spacious and study rooms available for all students for that important group study session before the exam. If you had a hard day at school, Morris Library is a great place to grab a cup of coffee and take a break. The students need a place like Morris Library. I know all of this comes at a cost and I know every student at SIU is grateful to everyone who help keep this place running and making it a better place than it already is. How has Morris Library been a part of your experience as an SIU student? I was lucky enough to be given a student worker job at Library Systems my very first semester at SIU and still work here. Since I worked here all my time at SIU, it has been a huge part of my experience as a student. I had the opportunity to meet and know a lot of students, staff, and administration. I understood it is not as easy as it looks to run this place, there is so much going on behind the scenes to manage everything that goes on in the library. I admire how all the departments at the library work with each other to provide the best they can to the students at SIU. I am happy I was given the opportunity to add my tiny bit to it. I love this place and I am sure I will miss working and being here. Do you have a message you would like shared with a potential donor? Morris Library is a place where every student is given the opportunity to search, study, evaluate and innovate. It is an amazing place for students to meet for group studies, connect and collaborate. There is so much Morris Library has to offer to students with various needs. I personally benefited so much from this facility and I know there are thousands more like me. Every donation made to Morris Library, I know would be another brick in keeping its foundation strong so more students can begin to build themselves up. If you had $1,000 to donate to the Morris Library, what would you like to see that money benefit? I would probably donate the money to maintain and service the electronic equipment at Morris Library. Since I work with Library Systems, I know how much students depend on the computers, classrooms, and printers. There are a lot of these electronic equipment that needs to be either repaired or serviced and we do not have the funds to work on them at the moment. There are several departments at Morris Library that stop functioning efficiently if one of their electronic equipment fails. Hence, I would donate the $1,000 to Library Systems. Saluki athletics has been a tradition on the campus of SIU Carbondale for a long time. SIU sponsors eight men’s and eight women’s teams in NCAA sanctioned sports. The Salukis currently compete as a member of the Missouri Valley Conference, with the exception of the men’s swimming and diving team who compete in the Mid-American Conference. The men’s teams consist of baseball, basketball, cross country, football, golf, swimming & diving, tennis, and track & field. Women’s teams consist of basketball, cross country, golf, softball, swimming and diving, tennis, track and field, and volleyball. Throughout the history of SIU athletics there have been 50 past students compete in the Olympic Games. SIU athletics takes pride in a long tradition of producing not only great athletes but great minds. During the 2015-2016 academic year, our student athletes combined to earn a GPA of 3.193. In the spring of 2016, 64 student-athletes recorded a perfect 4.00 GPA while 68 percent recorded a GPA of 3.00 or better. Your contribution is an investment in our student-athletes and their success. We are thankful for your generosity. William Schefelbein is a junior from Peoria, Illinois. He is a student at SIU College of Business specializing in management. Why did you choose SIU? My father is an alum of SIU and his degree has gotten him places. Also, the College of Business is in the top 5% of accredited business schools. I knew I would get a great education here. What inspired you to choose your area of study? I knew that I wanted to help others and be a servant leader. I did not know how to do that effectively. So, I chose management. I knew that with accomplished and experienced faculty and staff within the college, I would be able to learn how. What achievement in your life are you most proud of? I am most proud of my admittance into the Boeing Business Intern Program. I have applied for two years to get admitted into the program. In the fall of 2016, I got admitted for the summer of 2017. I will move to Seattle, WA at the end of May for a project management internship. Why should someone consider donating to the College of Business? The College of Business is a college of potential, a college with vision, a college with goals, and a college with aspirations. The college is constantly striving to provide students with professional development and opportunities. This is why someone should consider donating. Donations will further this in the college. When you instill these values in students, they pass it on. Do you have a message you would like shared with a potential donor? I hope you see SIU in the same way I do. SIU is my home, and it is the foundation of my career. The College of Business is a college that promotes diversity, encourages alumni partnerships, and fosters student achievement. I hope that your education and my education shows how pivotal the College of Business is and was to furthering ourselves. Thank you for your interest in the college, and if you can’t donate at this time, I encourage you to partner with the college of business in internships and externships. If you had $1,000 to donate to the College of Business, what would you like to see that money benefit? If I had $1000 to donate to the College of Business, I would further the Career Placement Center and internship partnerships. This is a part of the foundation of the College of Business. This center is how students gain experience, and it has benefited me greatly. 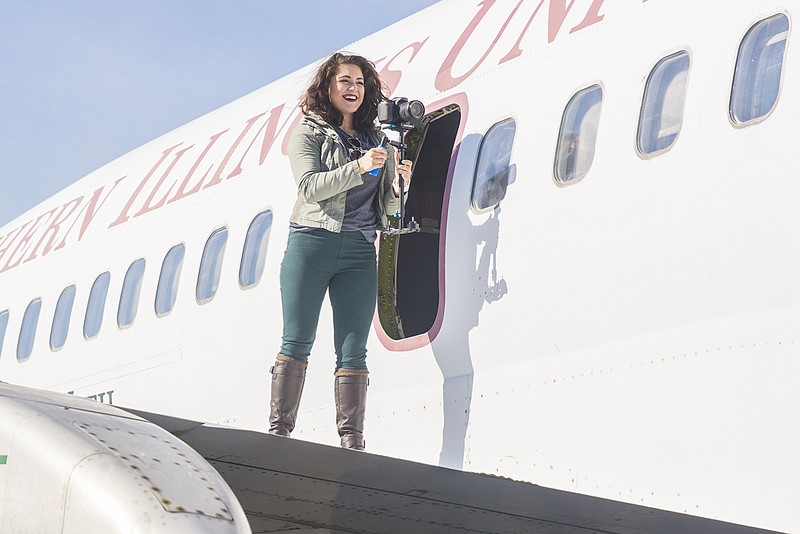 Foundation videographer, student Amanda Neushouser films aviation scenes for SIU Day of Giving video on the wing of a Boeing 737. Amanda Neuhouser is a senior from Bloomington, Illinois, specializing in cinema production. Her work can be viewed at www.neufilm.net and www.vimeo.com/neuhouser. What experiences, personality traits led you to videography? I was practically born with a camera in my hand. Photography is the first hobby I remember having. After taking my first editing class as a 12-year-old, I sought ways to make films. By middle school, I dreamed of being a famous YouTuber but developed that dream to the wider scope of filmmaking. 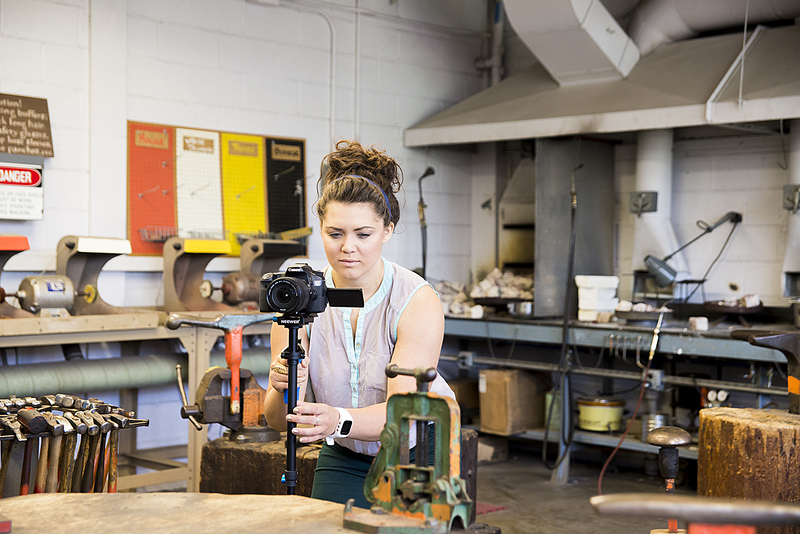 In college, I’ve found joy in producing videos stylized as short documentaries, telling the stories of businesses and individuals. Combining both short-media content and filmmaking, I find videography to be the best of both worlds. As a videographer, what opportunities have been presented to you that other students may not have? I’m constantly surprised by what opportunities arise each year. Just last semester, I was given the chance to board a Cessna aircraft and film aerial shots of Southern Illinois. My first gig as a freshman was filming a home football game on the field with a packed stadium, and at that point, I thought I had walked into a movie. Through different gigs and events, I’ve managed to film in every building on campus and speak with multiple department heads and students. I’ve gotten free passes to black tie events, I met Malcolm X’s daughter and gained access to areas of campus most students don’t. Best of all, holding a camera leads to countless interactions with people. The camera has an ability to create unexpected relationships. Being a videographer for SIU the past 3 ½ years has been the highlight of my college experience. What about SIU makes for good film? Are there people, places or events on campus that lend themselves to film more than others? 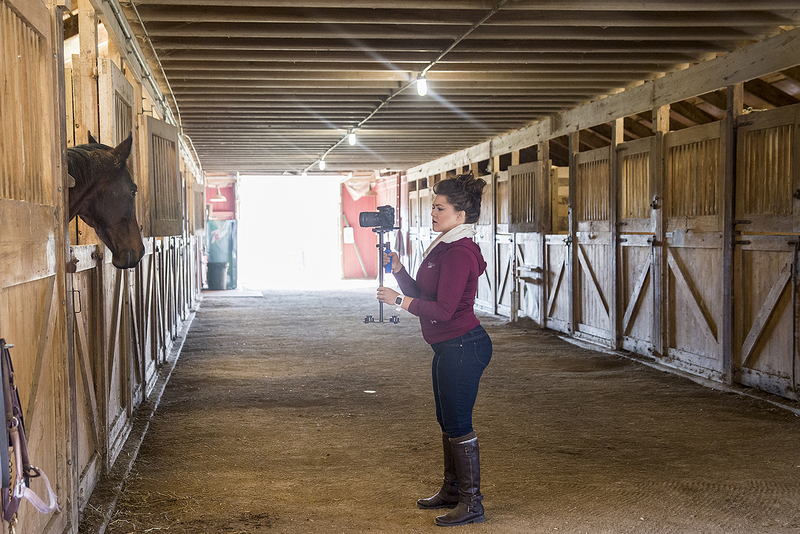 SIU students make for great filming because they each have personal stories to tell. Many students are doing outstanding work in their field, each with their own passions and side projects. I’ve found so much success interviewing these individuals for Student Spotlights on SIU’s social media platforms and find joy in walking in their shoes. They’re the ones that make the filming process interesting because I never know where they might take me. I even filmed a coal mining rescue team practice in a pitch black maze. I was pumped about the helmets with headlights we got to wear. What has surprised you while learning about videography and film? I’ve been surprised by how open strangers can become when they see a camera. It’s as if you’re already acquaintances, but only in the right setting. There’s a distinction between private space and the mindset someone has at a public event, and I love it when people come up to interact with me. I’m also surprised how often people freeze up as soon as you put a microphone on them for an interview. I’ve learned tricks to help get their mind off the camera and have a normal conversation. Where do you hope videography will take you? I hope videography will continue to be a lifelong side job, giving me the ability to pick and choose gigs. While it has been incredibly beneficial learning to tell a story in less than two minutes, I want to do more long-form narration in my career. 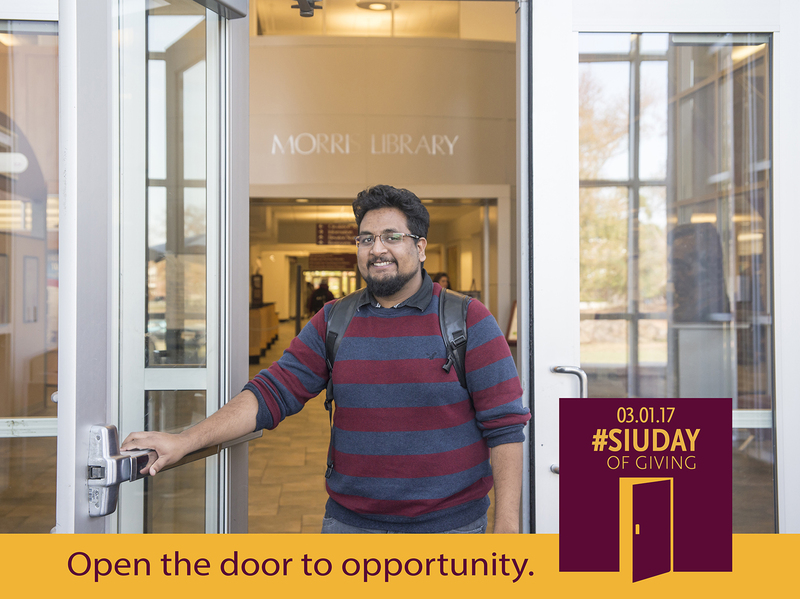 What have you learned about SIU while filming for the Day of Giving? I learned about what goes into producing an advertisement that is meant to be representative of an entire university. Almost all the departments we worked with were willing and excited to be involved in a project designed to benefit students. I learned the women I worked for were bosses at what they do, and I’d do well to be as strong and assertive as they are. The process gave me a new-found appreciation for how all the gears turn at SIU. Why would you like to see donors support Movie Camera Movement (MCM)? What does MCM offer students that is valuable? I would like donors to support Movie Camera Movement (MCM), a student-run filmmaking organization, because I’ve personally been involved with it for a few years. First, there are two things I don’t doubt. Films make a huge impact in shaping the minds of young adults, and when it comes to budget cuts, humanities and arts are at the top of the list. MCM is one of the fastest-growing student organizations on campus and is open to all majors. MCM cultivates a diverse and rich environment for anyone to share their voice. Graydon Baima is a junior from Collinsville, Illinois. He is specializing in Animal Science – Production. Why did you choose SIU? I choose SIU because the faculty made me feel like I was more than just a number. When I came to visit campus as a junior and senior in high school, I spoke with Dr. Atkinson and Peter Dirks. They showed a genuine interest in what I wanted to study, and made sure I signed up for the right classes during orientation. Peter made sure I was able to get a tour of the university farms even though the weather was horrible that day. They made me feel like I was family. What inspired you to choose your area of study? I fell in love with the idea of working with livestock when I was in the Boy Scouts. I was taking Horsemanship Merit Badge and I loved every second I was around the horses. When I learned about Animal Science as a major, I was ecstatic. I quickly learned through our introductory classes that working with cattle and horses was my ideal career. I focused on beef production and equine sciences. What achievement in your life are you most proud of? I am most proud of achieving my Eagle Scout rank in the Boy Scouts. This rank took many years of dedication and hard work to achieve. I recognize that many of my skills such as public speaking, professionalism, and hard work all had their foundations built in the Boy Scouts. Since enrolling at SIU, I have been able to build upon these skills and use them in day-to-day life. I would not be where I am at today without the opportunities and experiences I had while earning the rank of Eagle Scout. Why should someone consider donating to SIU College of Agriculture Sciences?The world must eat. No matter what economy we are in or what state the world is in, everyone must eat, and someone has to produce that food. In the College of Agricultural Sciences, we are the next generation of farmers, researchers, and conservationists. We are going to be the ones, 10 years down the road, in charge of making sure that there is food, natural resources, and sustainability. Our programs are always looking to be on the cutting edge of technology. Any donation would help provide the students with the most up-to-date information, and the ability to research new ideas. Do you have a message you would like shared with a potential donor? 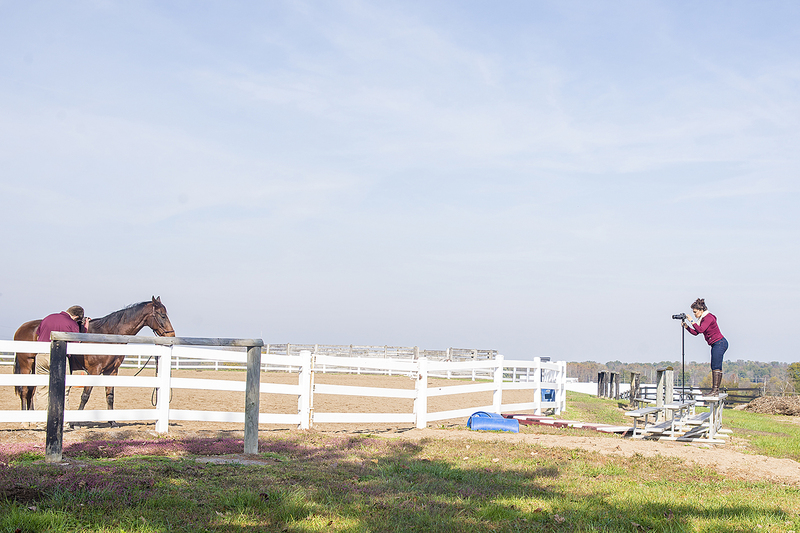 One of my favorite quotes is by a popular horse trainer Ray Hunt, he said, “ In difficulty, there is opportunity.” Right now, the university and state are in a difficult budget situation, but this creates a great opportunity for donors to really make a difference. Your donations help the college expand our programs and open new doors with new opportunities for students. When you are donating, you are not just giving to a college, you are fulfilling a student’s passion to do research, or you are allowing a student to do more hands-on activities during class. You are not donating to an institution… you are investing in the future of agriculture. If you had $1,000 to donate to the College of Agricultural Sciences, what would you like to see that money benefit? I would like to see that money benefit the University Farms. The farms have been a major part of my education and have given me so many opportunities. I want the farms to continue to offer great programs for future generations of Salukis. Our farms are unique in that they are so close to campus and there are countless projects and opportunities for students to gain real world experience. I currently spend 4 to 5 days a week at the farm and I hope that never changes. The farms are always looking to improve upon what is already in place, and I know that the donation would be used to greatly benefit students. Pictured (left to right): SIU Interim Chancellor Brad Colwell, Interim Vice Chancellor for Student Affairs Lori Stettler, Student Center Director Tena Bennett, Saluki Food Pantry Coordinator Sara Sauerhage, SIU Credit Union CEO Mike Lantrip, SIU Sustainability Coordinator Geory Kurtzhals, Director of Development Paul Melzer and SIU Credit Union VP of Business Development Kim Babington. Giving is in the DNA of those at the SIU Credit Union, and local charities have regularly been the beneficiaries of their benevolence. 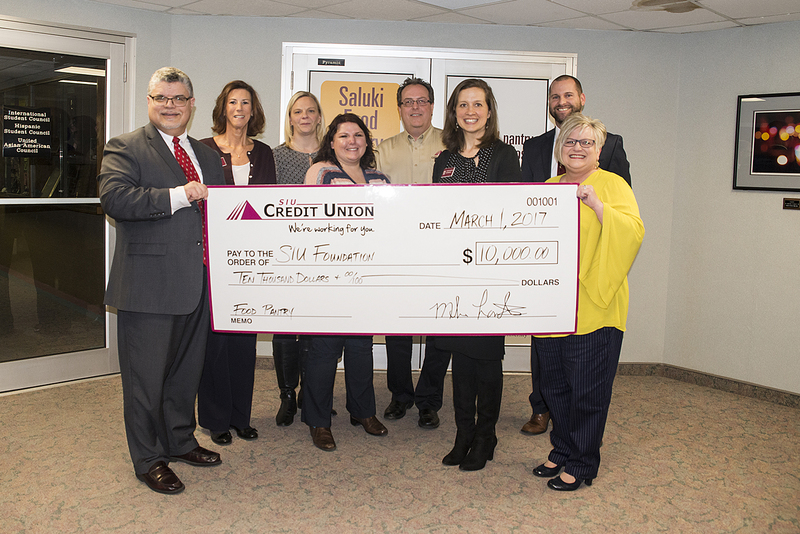 With the credit union’s recent $10,000 donation, the Saluki Food Pantry can be added to the long list of worthwhile causes. 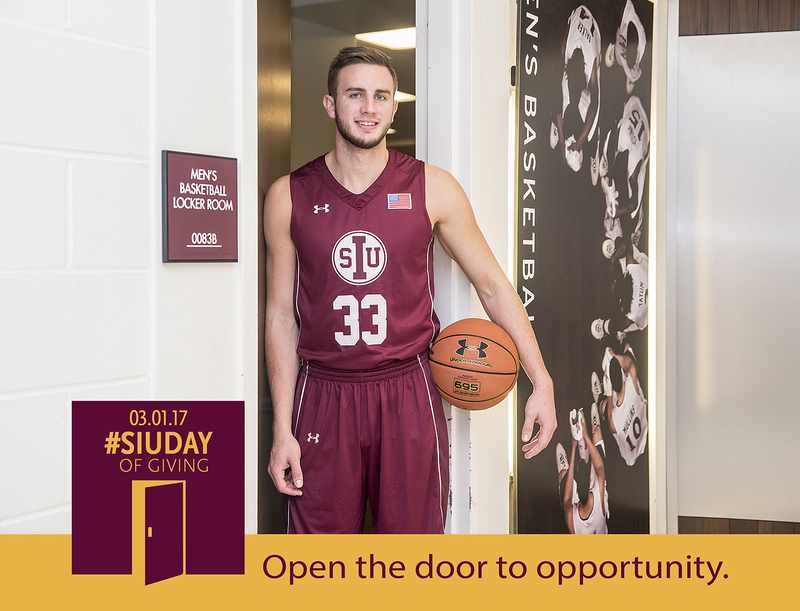 The gift serves as a prelude to SIU Day of Giving, which is Wednesday, March 1. 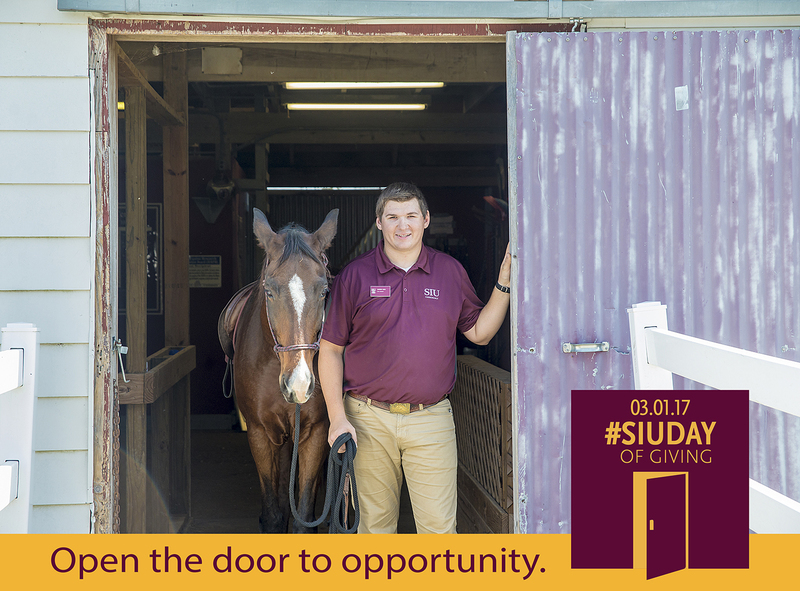 On that day, the university is encouraging others to follow the credit union’s philanthropic lead and help make an immediate difference in the lives of current and future Salukis. Robert Heusner is a graduate pre-medicine student from Thompsonville, Illinois. He is specializing in physiology. Why did you choose SIU? SIU offered research that I wished to be a part of. Their cancer research is probably the best in the Midwest. The researchers are amazing at what they do and the training they offered me was beyond what I could have expected from another university. What inspired you to choose your area of study? I was a part of an internship through SIH, and was in the middle of my OB rotation. I walked into this area with absolutely no expectation of what lied ahead of me. I was asked if I wished to observe a cesarean section and I jumped at the opportunity. From the moment I walked into the OR, I felt as if there was something bigger surrounding me. I watched the graceful movements of the obstetrician and the many other hands assisting her. It was within these twenty minutes that I realized that there was no other place on Earth I would rather be. I felt, like for once, I belonged. What achievement in your life are you most proud of? I am a first-generation college student and the only person from my high school getting a professional degree. 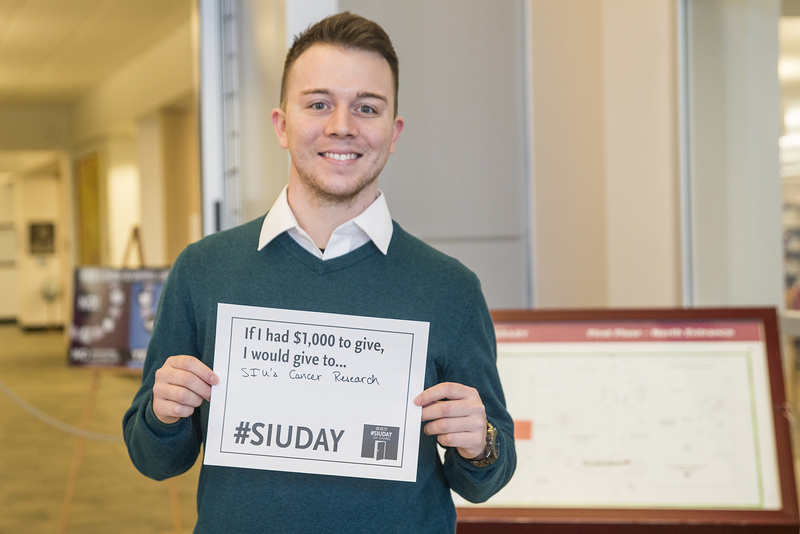 Why should someone consider donating to SIU? Because students are the future of our society. This generation and the next will be the most educated generations to have ever lived. Their potential should be the reason someone should invest in their future. Have you received any scholarships as a student? Yes. What does the scholarship mean to you and how has it enabled you to pursue your goals? It was everything to me. Though I wish it could have been more so I wouldn’t have to work 40 hours a week to support myself, my donor gave me an opportunity that I couldn’t be more grateful for. How has SIU inspired you? It has inspired me to never give up. My professors treat me with respect and actively acknowledge my potential. This makes all of the difference. Do you have a message you would like shared with a potential donor? Give all that you can. You aren’t simply ensuring that a student gets an education that could better only their life, you are making an investment in the future of our county and global society. 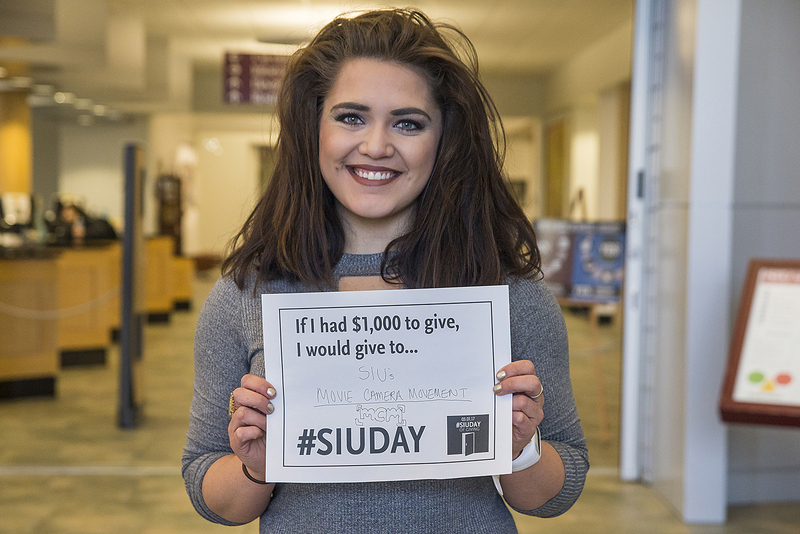 If you had $1,000 to donate to the SIU, what would you like to see that money benefit? Perhaps discounting food for students, research or for a student’s yearly expenses. What do you brag about most when you tell your friends about SIU? The exposure I get. I am involved in witnessing life changing research in action. I am also actively involved with labs that a majority of other potential medical students do not get to see until their second year of medical school. Andrea Meado is a SIU College of Science graduate student from Pearland, Texas.She is specializing in geology. Why did you choose SIU? SIU provided an excellent opportunity to work on exciting research projects while taking classes and teaching labs. What inspired you to choose your area of study? Geology allows me to do exciting field work all over the world and scientific research in the lab. I get to solve puzzles of Earth’s dynamic geologic history and find the challenge very rewarding. What achievement in your life are you most proud of? I am most proud of earning my Master of Science degree in geology from SIU and my bachelor’s degree back home in Houston. 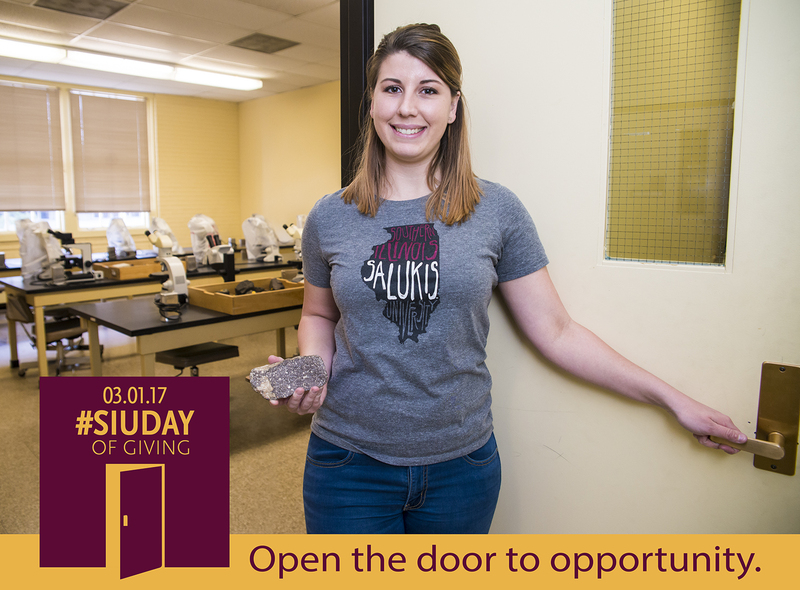 Why should someone consider donating to SIU College of Science? Donations help to continuously improve the quality of education at SIU. Modern equipment in specialized science labs keep students up to date with the advancing field and prepare them for the work force. Have you received any scholarships as a student? Yes, several as an undergrad and grad student. What does the scholarship mean to you and how has it enabled you to pursue your goals? Scholarships I have received help me with tuition, student fees, field work, research and presenting at conferences. All of these develop my skills as a scientist and qualify me for a career as a geologist. 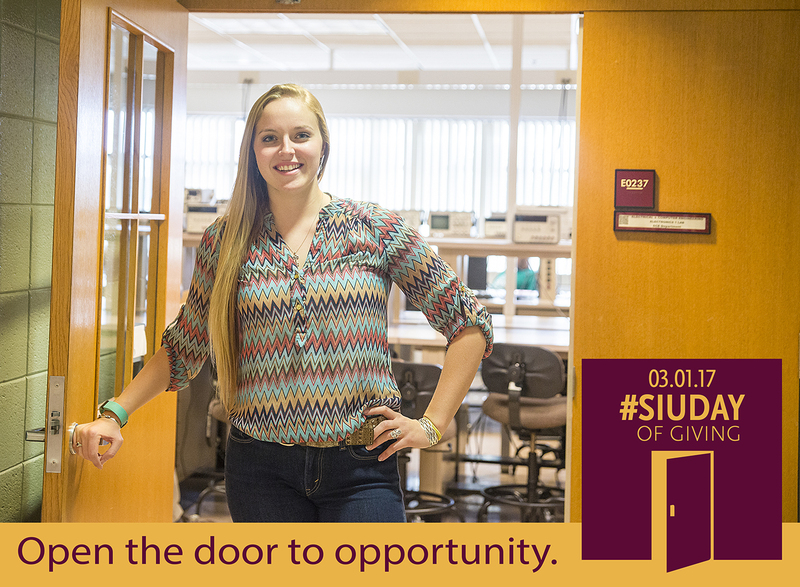 How has SIU College of Science inspired you? I enjoy the variety of students I meet in 100-level geology courses. These students are usually non-science majors so it is nice to see them getting excited about the Earth. Do you have a message you would like shared with a potential donor? Donations will help many students over years to come. Investments in education lead to high quality students that are prepared for careers upon graduation. If you had $1,000 to donate to SIU College of Science, what would you like to see that money benefit? I would put a $1,000 scholarship towards a Summer Undergraduate Research Fellowship for STEM majors. Senior research projects can lead to an undergraduate thesis and give the student an advantage when applying for graduate school or broadening their skills. What do you brag about most when you tell your friends about SIU? I tell people about the forest on campus and the nice running trail around Campus Lake. Jordan Taylor is a junior from Morton Grove, Illinois. He is specializing in Radio, Television and, Digital Media. Why did you choose SIU? 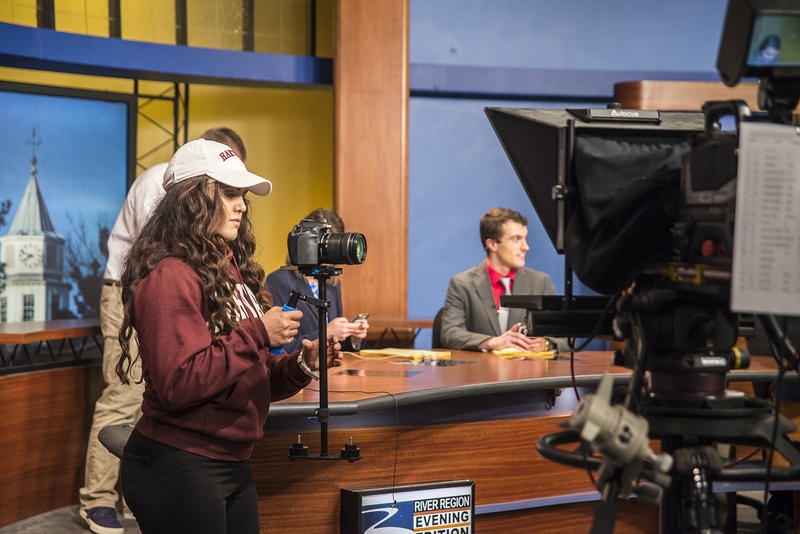 I chose SIU because of the television department and all that it had to offer its students. I also was accepted to my number one choice media based school, but after touring SIU and hearing all the great things the college of Mass Communication and Media Arts provides, it was a no-brainer. What inspired you to choose your area of study? I’ve worked in live television since I was in 7th grade. I worked for my church, New Life Covenant Southeast, where we broadcast four services live and it’s streamed to audiences all over the world. Working with this team really opened my eyes and allowed me to see that this is something I would like to make a career out of. What achievement in your life are you most proud of? I can’t say there’s one achievement that I’m most proud. Over the course of my career, I have done so much to be proud of. I have directed shows with award-winning gospel recording artists. Just before classes began this school year, on August 18th I was hired at WSIL-TV 3 as their weekend morning show Newscast Director and a couple months later I won an award for Best TV-Weathercast in the state of Illinois. These are some of the accomplishments that I will always remember as my career continues to grow. Why should someone consider donating to the College of Mass Communication and Media Arts? Anyone who has benefited from this college in anyway should consider donating. 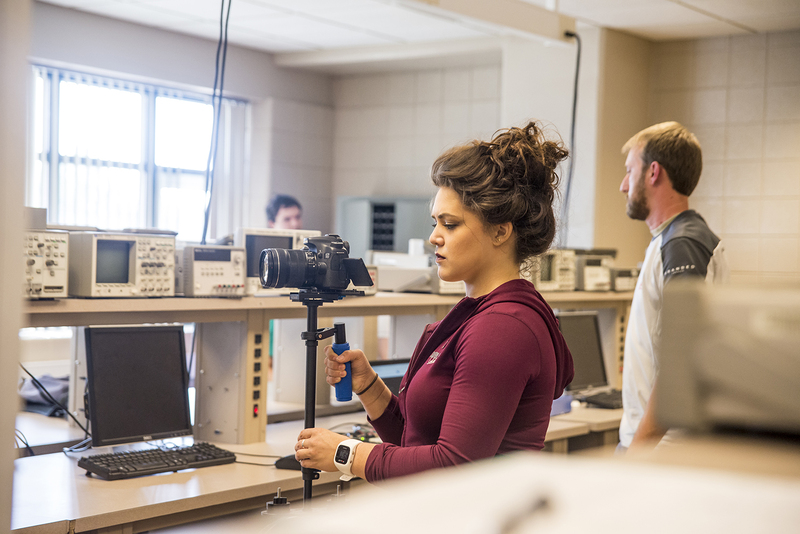 Mass Communications and Media Arts not only provides a classroom where students can learn and put their hands on some equipment that’s used in the business world, but it also provides the opportunity for students to put those skills they’ve learned to the test. This college gives students the ability to work in professional environments they would more or less encounter when they’re out in the real world. I can say from my personal experience, the College of Mass Communication and Media Arts gave me a ton of knowledge and hands-on experience that enabled me to get a director’s position for WSIL-TV 3, an ABC affiliate station. This is only because students are given the chance to put on live student run newscasts each week with updated cameras and control room technology. Given the equipment that we use, the faculty and staff that assist students hold our level of work to those of professional newscasts and that only makes students strive to do their best. Do you have a message you would like shared with a potential donor? It’s a fact that the College of Mass Communication and Media Arts produces outstanding results when it comes to students acquiring jobs right out of graduation or even while they’re still in school, like myself. I stay in touch with many graduates from this college who are now working full time in their professions. One thing I’ve noticed in all of them and even in myself, was the advantages taken while they were students. This is because all of these opportunities were in the palms of our hands and that’s all thanks to generous donations by so many alumni. If you had $1,000 to donate to the College of Mass Communication and Media Arts, what would you like to see that money benefit? Instructors and faculty do an amazing job bringing in people from around the country to show and tell students what we need to do to dominate in our fields. Last year, an award winning news videoagrapher, Lester Rose of CBS News, came in and held a two-day seminar showing us everything that has made him one of the best in the business. I thoroughly enjoyed every second of it. I say this because I would like to see that money benefit more events like this one. Bring in more people who can do what Mr. Rose did for us. I think those who attended this event improved their storytelling in news, in their shooting, as well as their editing of these stories. Learning from people who have been in the business for a long time is a great teaching tool and is something I think should be used a lot more throughout the year. Dana Mitchell is a senior from Chrisman, Illinois. She is specializing in Electrical and Computer Engineering. Why did you choose SIU? The first time I visited SIU, I knew when I walked onto campus that it was where I wanted to be. It just felt like home. I didn’t even visit any other universities after that. What inspired you to choose your area of study? I’ve always been curious about how things work and since I’m good at math I decided engineering. I chose to do computer and electrical because my dad was always working on electronic things and I found it really interesting. What achievement in your life are you most proud of? I’m currently vice president of the engineering honor society, Tau Beta Pi. Why should someone consider donating to the College of Engineering? People should consider donating to SIU College of Engineering because I have been more than just a student during my time here. I’ve gotten to know many professors and staff throughout my four years here. I feel like if I need help with something I have many people I could turn to. Do you have a message you would like shared with a potential donor? If you are on the fence about donating, come to the college and take a look around. SIU has a lot to offer students, especially at the College of Engineering. There are so many places money could be put to good use such as our computer labs, the RSOs and their workshops, and the labs for our classes as well. Our design RSOs are making major progress and becoming serious competitors against other schools. If you had $1,000 to donate to the College of Engineering, what would you like to see that money benefit? I would like it to go to the RSOs. I’ve been a part of different RSOs within my four years here. We always make it by on the budget we have but some extra funding would help the RSOs to prosper tremendously. If it is a competing RSO it could mean bringing home some more trophies as well!